Most automotive accessories look stupid and cheap when you tack them on to your ride. Eyelashes for headlights?...I don't know about you, but I get a little uncomfortable when I spot a sexualized Kia Forte. 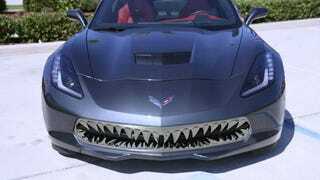 But I can get down with American Car Craft's Vette shark-teeth. This isn't just some glue and slap job...these teeth are laser cut and made from durable 304 stainless steel, then hand finished "skilled craftsmen." American Car Craft also guarantees the teeth will not rust or tarnish over time. So all that Porsche blood should wash right off. I say throw a set on the new Z06, and you will have a pretty menacing track-day predator.